"Jimmy Connors Pro Tennis Tour is a video game developed by Blue Byte and released in 1993. 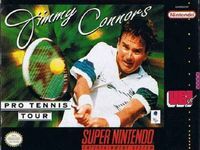 It is the second video game to feature Jimmy Connors after his name was used for the 1993 game, Jimmy Connors Tennis. 1. A training mode with five different instructors to hone various areas of your game. 2. An exhibition mode, in which you have the option of playing singles or doubles matches against the computer or watching the computer play demo matches. There are 16 players in the game (Jimmy Connors along with 15 fictional players), and all are selectable in exhibition mode. 3. The meat of the game is in the tour mode. Tour mode is divided into 12 months, and a certain number of tennis tournaments are held each month. For example, in January, the Australian Open is held, along with two other tournaments. Every tournament is worth a certain number of points for winning it, with major tournaments obviously worth more than minor tournaments. You will receive a certain number of points depending on your finish in each tournament which are added up over the course of the year. After each month of tour mode, you are given a password. If you choose to take a break from playing, you must write down this password to continue where you left off. Your objective is to achieve the number one ranking in the world by the end of the year by having the most points. All four of the Grand Slam tournaments are here, and Blue Byte added their own tournament as a fifth major. Source: Wikipedia, "Jimmy_Connors_Pro_Tennis_Tour," available under the CC-BY-SA License.